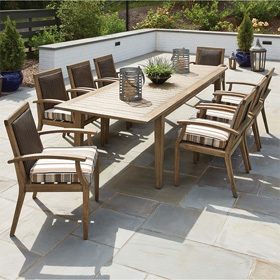 An ideal centerpiece for intimate outdoor dining arrangements, this bistro table features an ultra-durable wrought iron base with a reinforced bottom brace that provides extra strength. The table's subtle mesh top and minimalist aesthetic will be an excellent fit for any modern patio or outdoor living space. 24.5"L x 24.5"W x 29"H 37 lbs.